Concrete polishing is a process for turning a concrete floor into highly abrasion resistant, incredibly dense, smooth and visually appealing surface. Polished Concrete eliminates the need for epoxy or thin film coatings, guaranteeing a surface that can withstand even the toughest traffic. The polishing concrete process move through a succession of steps of diamond grinding using progressively finer grit sizes, application of a liquid densifier and optional The results are smooth, glossy, durable and attractive floor. 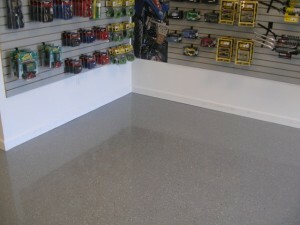 Polished concrete floors can be used in new or old construction for manufacturing, warehouses, automotive factories and showrooms, retail, commercial and industrial environments. Even homeowners are catching on the appeal of these smooth, high-luster floors, which can be stained to replicate the look of polished stone. The low maintenance, easy to clean polished surface has led more and more industries to realize the value of their existing concrete. Additional benefits of polishing concrete include its odorless application and environmentally friendly properties promoting a healthier working environment.